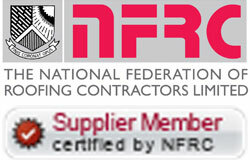 Training Centre Can EPDM Be Laid Over Existing Roof Coverings? Can EPDM Be Laid Over Existing Roof Coverings? Each EPDM membrane roofing system can be bonded to a range of different surfaces. This article covers the various do's and don'ts for each roofing system, the surfaces that can be bonded to and the adhesives required. ROT - If the existing roof deck and supporting timbers are rotten these will need to be removed and replaced. OSB3 or exterior grade plywood are both good deck materials for bonding the new waterproof membrane to. UPGRADE INSULATION - Whilst you are carrying out work on your roof it might be a good time to install a new warm deck insulation. If the existing roof deck is in good order then in most cases the existing waterproof layer such as felt can be left in place and the new insulation bonded over the top using PU adhesive or mechanically fixed using screws and washers. The new waterproof membrane can then be bonded to the insulation. We have listed below the preferred bonding surface for each of our EPDM systems along with the most appropriate adhesive. You will notice that the fleece backed DuoPly™ and bitumen backed RESITRIX® systems are more versatile. This is not an exhaustive list so if you dont find what you are looking for give us a call and we will do our best to help!